For the love of good music. It’s time we took a break and depending on whether you worship Saturn, Thor, or the Sun God, consider this gospel music. We shall continue in due course with Genesis. Here is a long video for those of you who are inclined scientifically and are trying to understand our universe. Get pop corns read, a blanket and a cup or two of coffee, then lie on the couch and let your mind be blown away by this interesting physicist. 18 Now the Lord appeared to him by the oaks of Mamre, while he was sitting at the tent door in the heat of the day. 2 When he lifted up his eyes and looked, behold, three men[did God come with his brothers or he has guards?] 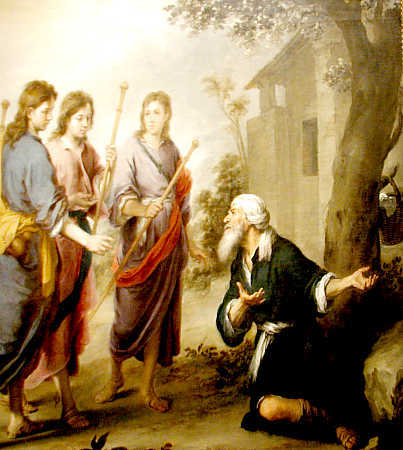 were standing opposite him; and when he saw them, he ran from the tent door to meet them and bowed himself to the earth, 3 and said, “My Lord, if now I have found favor in Your sight, please do not pass Your servant by[since they are three dudes, who is his Lord? How do we tell one from the other]. Good old Abe welcoming his God. He must be one of the three! 7 Abraham also ran to the herd, and took a tender and choice calf and gave it to the servant, and he hurried to prepare it[so the gods also love choice meat!]. 8 He took curds and milk and the calf which he had prepared, and placed it before them; and he was standing by them under the tree as they ate[they must have been really hungry to wait for bread to be baked and a choice calf be chosen, slaughtered and BBQed]. 9 Then they said to him, “Where is Sarah your wife?” And he said, “There, in the tent.” 10 He said[Am confused here, they asked, he said; how many Gods are speaking or is this particular verse written by two competing scribes? ], “I will surely return to you at this time next year; and behold, Sarah your wife will have a son.” And Sarah was listening at the tent door, which was behind him. 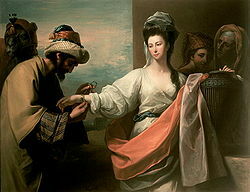 11 Now Abraham and Sarah were old, advanced in age; Sarah was past childbearing. 16 Then the men rose up from there, and looked down toward Sodom; and Abraham was walking with them to send them off. 17 The Lord said[ As i have said, I am going to need help here, is Abraham’s God a man, 3 men or what? I don’t get it! ], “Shall I hide from Abraham what I am about to do[ do I see a guilty conscience from the good Lord? ], 18 since Abraham will surely become a great and mighty nation, and in him all the nations of the earth will be blessed[ Is Abe’s God planning another destruction of humanity. He does have this ruminations when he is about to do something of this kind]? 22 Then the men turned away from there and went toward Sodom, while Abraham was still standing before the Lord. 23 Abraham came near and said, “Will You indeed sweep away the righteous with the wicked[here it seems to me Abe is more rational than his God or why is he having this discussion? What does this say about Abe’s God?]? 24 Suppose there are fifty righteous within the city; will You indeed sweep it away and not spare the place for the sake of the fifty righteous who are in it[ I think I would really want to have a discussion with this God. I have a few of my questions too!]? v25 to 33 is an exchange between Abe and his God on what it would take him not to destroy Sodom and Gomorrah and it’s inhabitants. In all honesty, this discussion shouldn’t have been had in the first place. The omniscient God should have a better way of plucking those he thinks are wicked without causing destruction or killing innocents. You are free to disagree, but then you will have to give me a reason to believe your God on his merits! Walk before Me, and be blameless[with his propensity for pimping am not sure he will manage this]. And you will be the father of a multitude of nations[Abe and his god already went through this. I’ve asked if this god has a memory problem or he inspires his scribes to repeat what he has already said]. V9 -13 Is the statement and conditions of the covenant between God, Abraham, his descendants and his slaves. How many christians follow this covenant is doubtful. Recently a court in Germany found circumcision of infant boys to be criminal. 18 And Abraham said to God, “Oh that Ishmael might live before You!” 19 But God said, “No, but Sarah your wife will bear you a son, and you shall call his name Isaac; and I will establish My covenant with him for an everlasting covenant for his descendants after him. 20 As for Ishmael, I have heard you; behold, I will bless him, and will make him fruitful and will multiply him exceedingly. He shall become the father of twelve princes, and I will make him a great nation[just asking, why not make a covenant with both of them? They are all sons of honest Abe]. 21 But My covenant I will establish with Isaac, whom Sarah will bear to you at this season next year.” 22 When He finished talking with him, God went up from Abraham[god must reside somewhere or why he would he go up? while still on the point of going up, could the NASA scientists driving curiosity tell us if they have shots of this heavenly palace unless it’s further up]. 23 Then Abraham took Ishmael his son, and all the servants who were born in his house and all who were bought with his money, every male among the men of Abraham’s household, and circumcised the flesh of their foreskin in the very same day, as God had said to him. 24 Now Abraham was ninety-nine years old [he will be past 100yrs when Isaac is born and just so you don’t ask me later; Sarah his wife/sister is 10yrs his junior] when he was circumcised in the flesh of his foreskin. 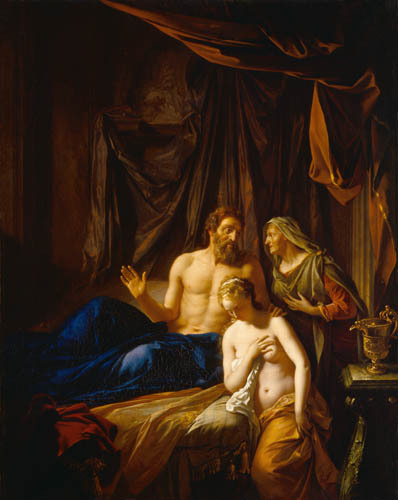 25 And Ishmael his son was thirteen years old when he was circumcised in the flesh of his foreskin. 26 In the very same day Abraham was circumcised, and Ishmael his son. 27 All the men of his household, who were born in the house or bought with money from a foreigner, were circumcised with him[who was doing the circumcision? This order has just been issued, how did they ensure the procedure is safe? Am just asking]. 16 Now Sarai, Abram’s wife/sister had borne him no children[nothing new here, when she was introduced in an earlier chapter, we were told she was barren], and she had an Egyptian maid whose name was Hagar. 2 So Sarai said to Abram, “Now behold, the Lord has prevented me from bearing children[We can’t blame here here, knowledge of reproduction was not understood at this point in time. 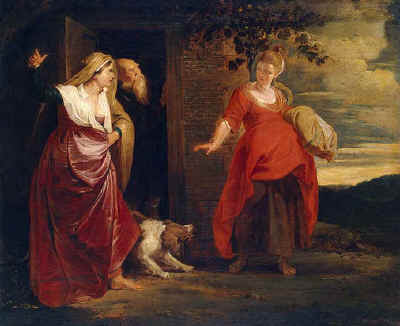 She could safely blame one of the gods for stopping her from getting pregnant].Please go in[i hope you know what this means] to my maid; perhaps I will obtain children through her.” And Abram listened to the voice of Sarai. 3 After Abram had lived ten years in the land of Canaan, Abram’s wife Sarai took Hagar the Egyptian, her maid, and gave her to her husband Abram as his wife. 5 And Sarai said to Abram, “May the wrong done me be upon you[where is the wrong? she authorized the relationship]. I gave my maid into your arms, but when she saw that she had conceived, I was despised in her sight. May the Lord judge between you and me.” 6 But Abram said to Sarai, “Behold, your maid is in your power; do to her what is good in your sight[why is Abram shirking responsibility, does he expect Sarai to be merciful to Hagar? ].” So Sarai treated her harshly, and she fled from her presence. 13 Then she called the name of the Lord who spoke to her, “You are a God who sees”; for she said, “Have I even remained alive here after seeing Him[later on we will be told no one can see the lord and live. So either the scribe was not aware of these times when people saw God or he will change his mind about being seen]?” 14 Therefore the well was called Beer-lahai-roi; behold, it is between Kadesh and Bered. 15 So Hagar bore Abram a son; and Abram called the name of his son, whom Hagar bore[why the repetition], Ishmael[I thought he was given this name by the gods or is it Abram, am confused here].16 Abram was eighty-six years old when Hagar bore Ishmael to him[this guy has vitality, seriously at 86!]. 4 Then behold, the word of the Lord came to him, saying, “This man will not be your heir; but one who will come forth from your own body, he shall be your heir.” 5 And He took him outside and said, “Now look toward the heavens, and count the stars, if you are able to count them[Abram was a privileged dude, God wakes him from his sleep or is the dude sleep walking? ].” And He said to him, “So shall your descendants be.” 6 Then he believed in the Lord[we can deduce here that before this he didn’t believe in the Lord, or this wouldn’t have been said]; and He reckoned it to him as righteousness. 7 And He said to him, “I am the Lord who brought you out of Ur of the Chaldeans, to give you this land to possess it[why has the lord to identify himself unless Abram has other gods? ].” 8 He said, “O Lord God, how may I know that I will possess it?” 9 So He said to him, “Bring Me a three year old heifer, and a three year old female goat, and a three year old ram, and a turtledove, and a young pigeon.” 10 Then he brought all these to Him and cut them in two, and laid each half opposite the other; but he did not cut the birds[if the birds are still alive, indulge me, were they hypnotized? How did he convince them to not fly away?]. 11 The birds of prey came down upon the carcasses, and Abram drove them away.